Cheetahrama by Deborah Gregory collection includes groovy CASES, collector plates, fascinators, jewelry and hair accessories! There are over 300 growl-icious designs in the Cheetahrama by Deborah Gregory decoupage art case collections of pillboxes, small mirror compacts, business card holders, flat wallet cases, cigarette cases, vanity cases (contain long mirror and tissue holder), etc. They’re handcrafted so variation in design will occur but they’re sturdy, waterproof and generally quite durable. Below, you will be able to purchase a few of our absolute favorites via secure server and paypal carts (which means your credit card information is not seen by us). If you’re interested in something specific or a custom order, please send an email to: mamacheetahs@aol.com. 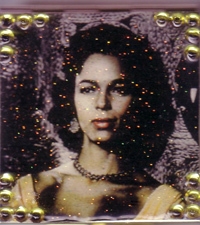 Beloved Hollywood black icon Dorothy Dandridge on a business card holder and square mirror compact embellished with topaz crystals. Also available as a vanity case (long flat case which has mirror inside and clip; underneath clip are three sniff tissues). Exclusive vanity case. 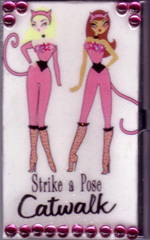 Two purrlicious catty girls adorn the case with crystals on its borders. Silver finish. On back–faux leopard design. Inside of this very useful case: on the left is a mirror; on the right is a clip. Underneath the clip are three Sniff Glamour Girl tissues. 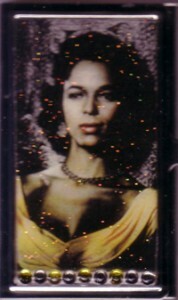 You can use this case to carry money, cards, cigarettes, condoms, etc. Carry in your purse with confidence or simply leave on your vanity. 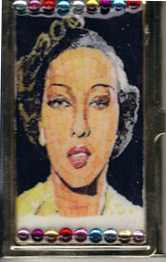 Dimensions: 4.7 inches long/height x 2.7 inches wide/across x 1/2 depth. Comes in a Cheetahrama gift box. 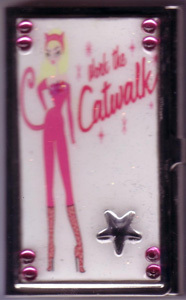 Work the Catwalk business card holder credit card case exclusive. Blonde feline fatale embellished with crystals. Silver finish. Also available as a Vanity Case (has mirror and clip inside; underneath clip are three Sniff tissues). 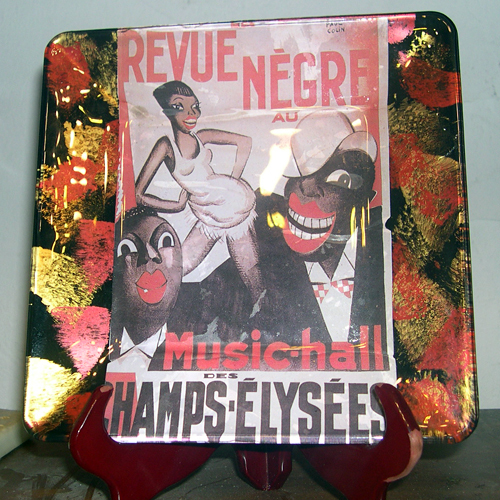 Artistic image of the iconic legend, Josephine Baker. Crystal border. 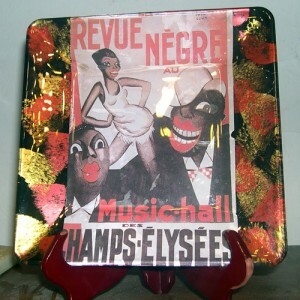 Each mixed media collage designed plate (small, medium, or large) is signed and numbered on back making it a true collector item. Will ship worldwide. Medium square plate dimensions: 6.9 inches x 6.9 inches.